The Belgaum city & taluka Photo and Videographer’s association in association with Rotary Club of Venugram have organised an open photo contest and exhibition. This photo contest is for budding photographers of all ages. 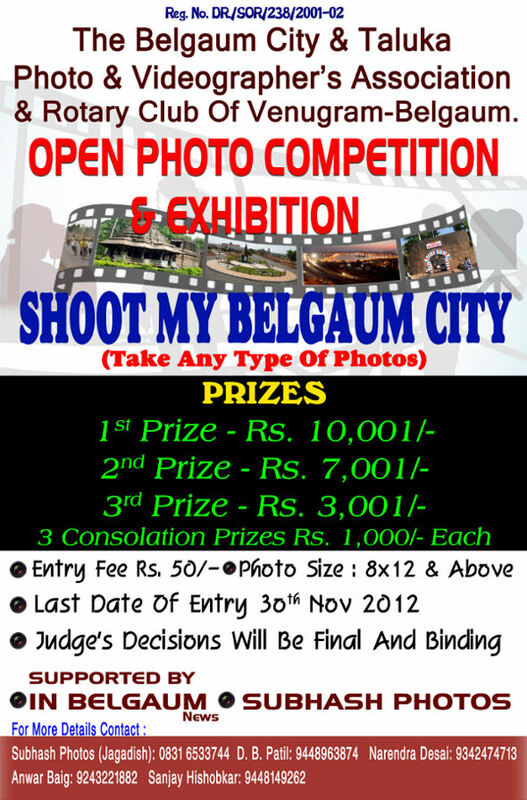 This contest celebrates the love and passion towards Belgaum and the same should be visible through the photos. The theme of the Photo contest is “Shoot my Belgaum city” which can consist of any types of photos portraits, landscapes etc. A jury will reward the best pictures, which must be original and dynamic, highlighting Belgaum. The first prize is Rs.10,001, Rs.7,001 and Rs.3,001 for second and third respectively. The last date for submission of the photos in print format in specific size of 8 inches by 12 inches is November 30, 2012. The Entry fee is Rs.50/- for the photo contest.